Heavy minerals (dark) deposited in quartz beach sand in Chennai, India. Sedimentology encompasses the study of modern sediments such as sand, mud (silt), and clay, and understanding the processes that deposit them. It also compares these observations to studies of ancient sedimentary rocks. Sedimentologists apply their understanding of modern processes to historically formed sedimentary rocks, allowing them to understand how they formed. 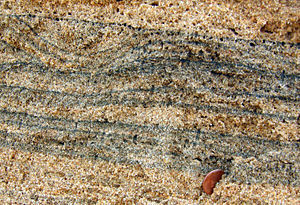 Sedimentary rocks cover most of the Earth's surface, record much of the Earth's history, and harbor the fossil record. Sedimentology is closely linked to stratigraphy, the study of the physical and temporal relationships between rock layers or strata. Sedimentary rocks are useful in various applications, such as for art and architecture, petroleum extraction, ceramic production, and checking reservoirs of groundwater. The aim of sedimentology, studying sediments, is to derive information on the depositional conditions that acted to deposit the rock unit, and the relation of the individual rock units in a basin into a coherent understanding of the evolution of the sedimentary sequences and basins, and thus, the Earth's geological history as a whole. Uniformitarian geology works on the premise that sediments within ancient sedimentary rocks were deposited in the same way as sediments that are being deposited on the Earth's surface today. In other words, the processes affecting the Earth today are the same as in the past, which then becomes the basis for determining how sedimentary features in the rock record were formed. One may compare similar features today—for example, sand dunes in the Sahara or the Great Sand Dunes National Park near Alamosa, Colorado—to ancient sandstones, such as the Wingate Sandstone of Utah and Arizona, of the southwest United States. Since both have the same features, both can be shown to have formed from aeolian (wind) deposition. The principle of superposition is critical to the interpretation of sedimentary sequences, and in older metamorphic terrains or fold and thrust beltsm where sediments are often intensely folded or deformed, recognizing younging indicators or fining up sequences is critical to interpretation of the sedimentary section and often the deformation and metamorphic structure of the region. Folding in sediments is analyzed with the principle of original horizontality, which states that sediments are deposited at their angle of repose which, for most types of sediment, is essentially horizontal. Thus, when the younging direction is known, the rocks can be "unfolded" and interpreted according to the contained sedimentary information. Organic sedimentary rocks are important deposits formed from the accumulation of biological detritus, and form coal and oil shale deposits, and are typically found within basins of clastic sedimentary rocks. Carbonates are composed of various carbonate minerals (most often calcium carbonate (CaCO3)) precipitated by a variety of organic and inorganic processes. Typically, most carbonate rocks are composed of reef material. Evaporites are formed through the evaporation of water at the Earth's surface and are composed of one or more salt minerals, such as halite or gypsum. Sedimentary rocks provide a multitude of products that both ancient and modern societies have come to utilize. Groundwater: Sedimentary rocks contain a large proportion of the Earth's groundwater aquifers. Human understanding of the extent of these aquifers and how much water can be withdrawn from them depends critically on knowledge of the rocks that hold them (the reservoir). The longstanding understanding of how some mudstones form has been challenged by geologists at Indiana University (Bloomington) and the Massachusetts Institute of Technology. The research, (which appears in the December 14, 2007, edition of Science, by Schieber et al. ), counters the prevailing view of geologists that mud only settles when water is slow-moving or still. Instead, it shows that, "muds will accumulate even when currents move swiftly." The research shows that some mudstones may have formed in fast-moving waters: "Mudstones can be deposited under more energetic conditions than widely assumed, requiring a reappraisal of many geologic records." Macquaker and Bohacs, in reviewing the research of Schieber and coworkers, state that "these results call for critical reappraisal of all mudstones previously interpreted as having been continuously deposited under still waters. Such rocks are widely used to infer past climates, ocean conditions, and orbital variations." ↑ Raymond Siever, Sand (New York: Scientific American Library, 1988, ISBN 071675021X). ↑ P.E. Potter, J.B. Maynard, and P.J. Depetris, Mud and Mudstones: Introduction and Overview (Berlin, DE: Springer, 2005, ISBN 3540221573). ↑ Georges Millot, W.R. Farrand, Helene Paquet (trans. ), Geology Of Clays: Weathering, Sedimentology, Geochemistry (Berlin, DE: Springer Verlag, 1970, ISBN 0412100509). ↑ Gary Nichols, Sedimentology & Stratigraphy (Malden, MA: Wiley-Blackwell, 1999, ISBN 0632035781). ↑ Donald R. Prothero and Fred Schwab, Sedimentary Geology: An Introduction to Sedimentary Rocks and Stratigraphy (New York: W.H. Freeman, 1996, ISBN 0 7167 2726 9). ↑ Physorg, As waters clear, scientists seek to end a muddy debate. Retrieved June 21, 2008. Allen, John R.L. 2001. Principles of Physical Sedimentology. Caldwell, NJ: Blackburn Press. ISBN 1930665105. Boggs, Sam Jr. 2005. Principles of Sedimentology and Stratigraphy. Upper Saddle River, NJ: Pearson Prentice Hall. ISBN 0131547283. Hsü, Kenneth J. 2004. Physics of Sedimentology. New York: Springer. ISBN 3540206205. Millot, Georges, W.R. Farrand, and Helene Paquet (trans.). 1970. Geology Of Clays: Weathering, Sedimentology, Geochemistry. Berlin, DE: Springer Verlag. ISBN 0412100509. Nichols, Gary. 1999. Sedimentology and Stratigraphy. Malden, MA: Wiley-Blackwell. ISBN 0632035781. Suthren, Roger. 2006. Sedimentology. virtual-geology.info. This page was last modified on 27 August 2015, at 14:57.